For now, the i-ROAD is a concept, but carmakers are showing more and more interest in urban mobility alternatives. It’s a trike! It’s a car! Or at least, it’s a Toyota. It’s hard to exactly sum up this new three-wheeler Toyota plans to unveil at the Geneva Motor Show. 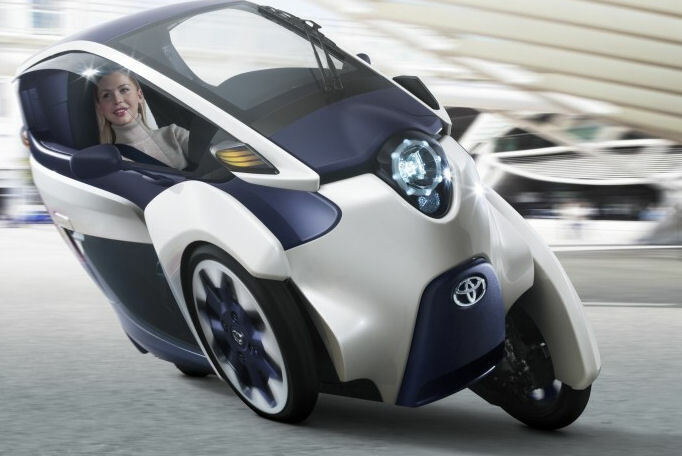 Toyota is calling it a Personal Mobility Vehicle, but it looks like a compromise between riding a scooter, fending off helmet hair, and keeping your safety-conscious mother happy. The new PMV (Toyota calls this particular model the i-ROAD) has what Toyota calls Active Lean technology, to keep it stable. Like Piaggio’s MP3, it’s a leaning three-wheeler. It’s only 850 mm wide, and can run 30 miles on a charge. It takes three hours to re-charge. Power comes from a lithium-ion battery. There is a 2kW electric motor in each front wheel. Of course, naysayers will point out that’s not a lot of range – and they’d be right. But as more and more automotive giants start to build these sort of concepts, you know the technology to make them an affordable reality is on its way. Unfortunately analogue is dead for automakers and endofdays is right about planned obsolescence. On the positive side manufacturing quality means that vehicles last a lot longer than they used to. I have a 2006 2 wheel drive 6 cylinder Toyota tundra that I beat the crap out of and is going strong at 210,000km. No oil consumption, even the original battery and no noticable drop in fuel economy. I just wish it was diesel and 4 wheel drive as I’m tired of getting stuck in 2″ of snow on level ground. I have an idea that would pay off faster for Toyota than this turd. How about putting your small diesel engine in some vehicles for North America. Specifically the 4 wheel drive Tacoma. Toyota makes one for Asia. As for the emmisions issue nitrogen injection seems to work for Dodge etc. HA ha ha, you have got to be joking. Today’s economy is dependent upon planned obsolescence. If a shrewd business did that they would not survive. The “masses” want technology, efficiency, sheep mentality of what everyone else has (eg. iphone) and a upgrade in 3 years aka cheap lease. They don’t give a crap about repair-ability. This is obviously not and never will be a true motorcyclists market….therefore I don’t care. Another really stupid idea. Well done, Toyota.